Keeping your Postcode Maps and Data up-to-date is easy and affordable with our Annual Subscription Postcode Update Service..
Our Australian GIS Postcode Data products are available for individual States / Territories, and as a discounted compilation for our whole nation. They are available in most widely used digital GIS formats (ESRI .shp; MapInfo Mif/Mid; and KML for use with the amazing and free Google Earth – please see the Supplementary Licence Conditions for supply in Google KML format). 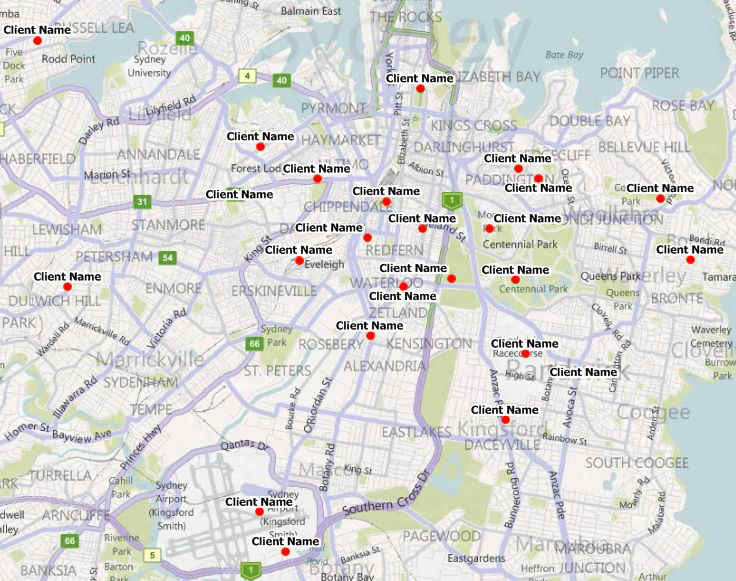 These are suitable for a large range of advanced marketing and business analysis applications within a geographic information system (GIS) application. If you haven’t heard of GIS before, we have a Quick Introduction to GIS which you may find worth a look, in order to help you decide which of our products best meet your needs. 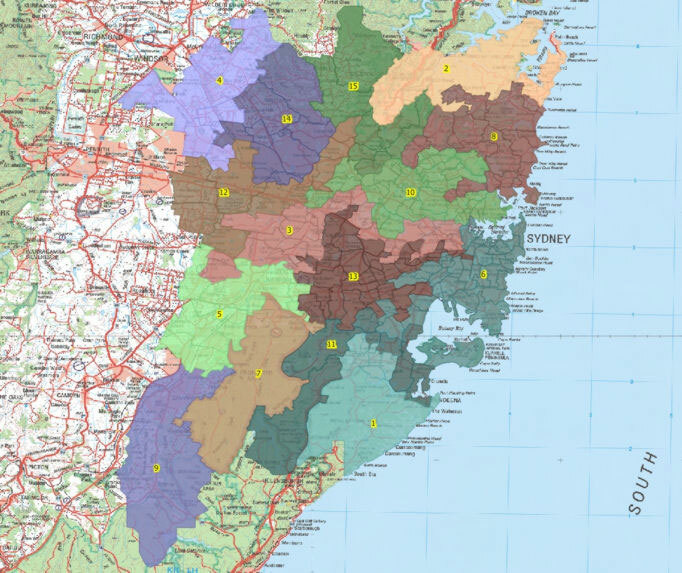 GIS Data products are maintained regularly and are up to date for current 2018 Australia Post revisions. You Can see some examples of their use below. For users new to GIS and who would like some help getting started, you may be interested in our GIS software support options. The following examples illustrate a number of approaches to creating, displaying and using postcode area geography in the context of territory or franchise mapping, we hope you find them informative!You can find an overview of things to take into account when planning such an exercise on the site here. 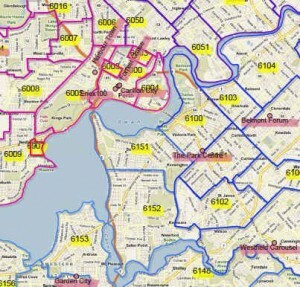 Seen here an illustration of our Postcode Area data deployed in a sales territory / franchise application. Commencing with fifteen existing businesses, we have used their addresses including postcode, to automatically generate sensible territories for each, using adjacent postcode areas. In this case we have used total area in square kilometres to best apportion territories. If we had other data, for example population density, mean income or other value of interest, we could have used one or more to create the territories. 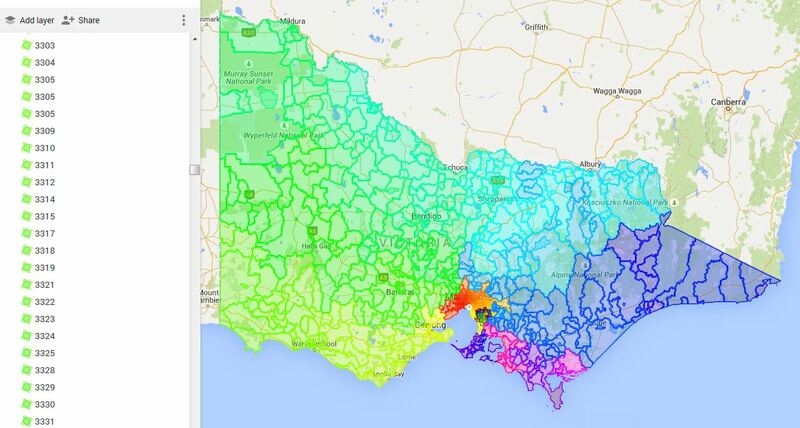 You would require our GIS Data products to undertake such work yourself, and of course you will need a GIS application and the expertise to run it. Alternatively we can undertake such tasks for you. 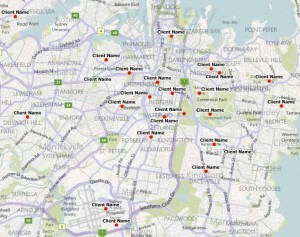 Please take a look at our custom mapping services section for an overview of custom mapping services. 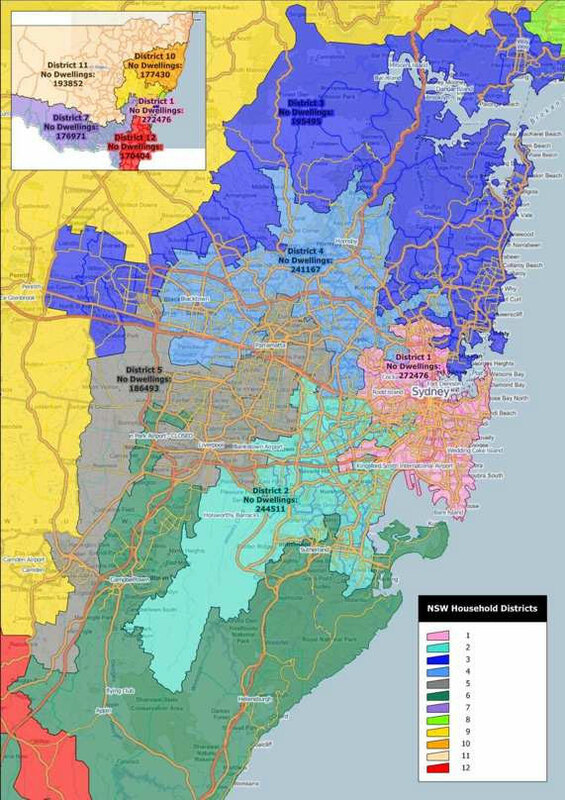 The size of the resulting regions varies greatly – relatively small areas in metropolitan Sydney to huge areas in outlying parts of the state. This reflects the density of housing. A franchisor would often modify the License costs of individual regional franchise areas to take into account variables such as travel or distribution costs, in addition to the variation in target numbers. It is often possible to obtain a more even match of target numbers per region if we are prepared to accept that they will comprise both adjacent and remote postcode areas. For most businesses this is not desirable, but it is always an option. 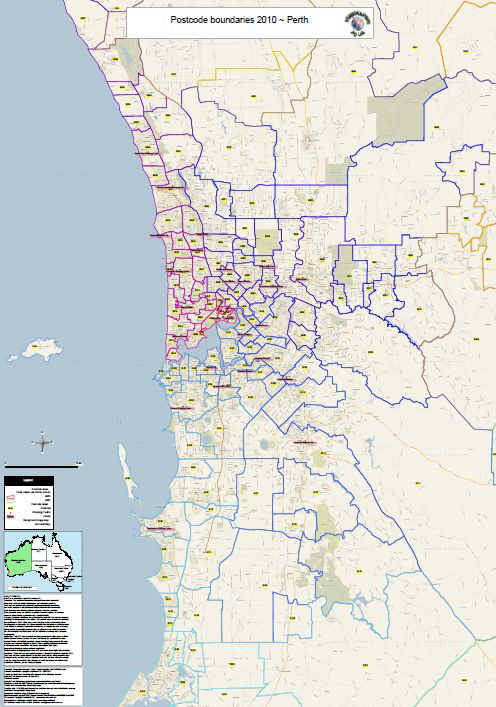 This is a customised version of one of our City Map Series Perth WA; it incorporates “customer supplied” data listing the addresses of business with which they deal; we convert such lists into geographical points, format to suit including custom backgrounds (a Bing Street Map in this example) and supply in the same searchable format as our standard Map Series range. It costs a little more, but that’s how it is with something tailored to fit your specific needs! A detailed view is below.. Here another set of customer addresses has been processed to allow them to be seen on a map, the red points are the customer’s clients. This allows us see all sorts of additional information. In this case (right) our customer is an agent for four manufacturers and likes to visit her clients at least every six months – 26 weeks. She can only travel safely with the merchandise of one manufacturer at a time. Here all her clients overdue a visit are shown as triangles, so it is evident that a group of four clients using manufacturer 4 products can be visited efficiently in a single trip as a priority. Owing to the “open” nature of the Google community, there is a Supplementary Licence Agreement required for supply of our Data Series in Google KML format. The License wording is illustrated here. This is the PC005SADAT product when deployed within Google Earth.. Our Postcode Area products will open immediately within Google Earth when requested in KML format. This view has placemarks added for Adelaide CBD, North Adelaide, Western Suburbs and Adelaide International Airport. 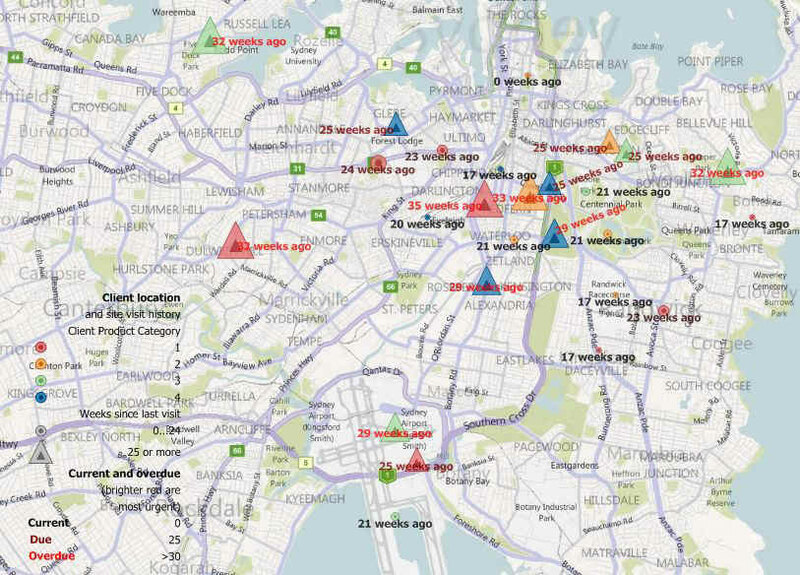 Places of interest, facilities and a host of other location based information can be added – incredible! You could even manually create sales territories within Google Earth using the .KML version of our DAT products.The most effective way to do this is by using a GIS software application, especially if your requirements are complex and / or extensive. However if you wish to do this manually (for whatever reason! ), it is possible to do so using Google Earth (which is free) and our Data Series products in KML format. 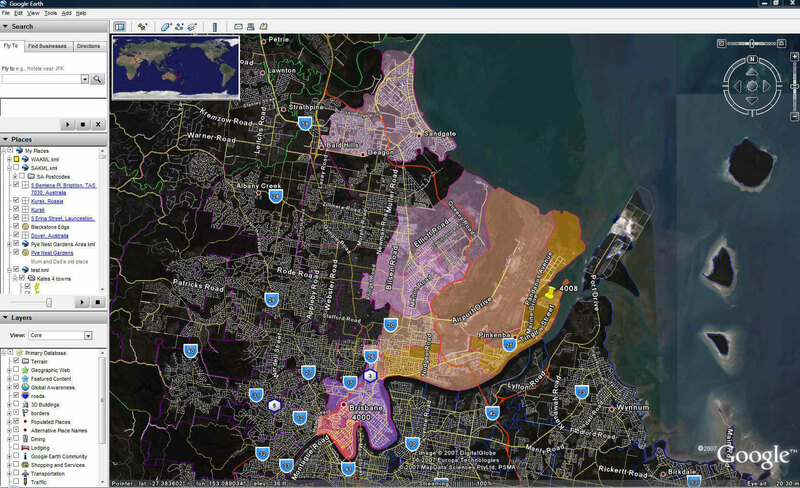 This example shows central Brisbane with a small number of Postcode Areas manually assigned to territories by use of view properties within Google Earth, using the KML version of PC003QLDDAT – Brilliant! 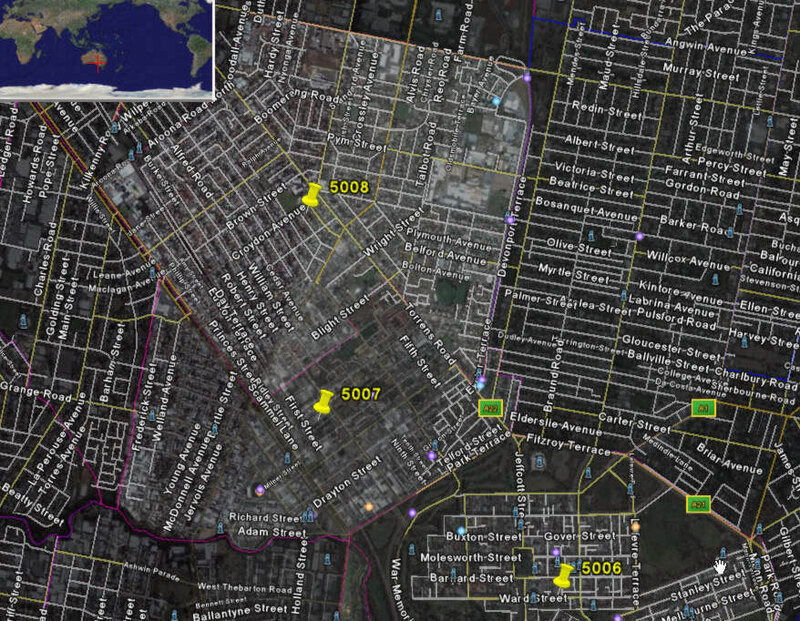 You can even search for addresses and view streets in Google Earth – amazing! If I can use GIS data in Google Earth or Google Maps for free, why would I ever consider buying a GIS application? While Google Earth and Maps are fabulous innovations (and free), you should be aware of some limitations which may affect how your objectives can be achieved through these applications alone. First, the format used by Google (KML) is by default limited to two data attributes, plus an optional third (“height”) value for Google Earth only (this is how the “skyscraper” maps are created). We do have the capability to expand on this limit to some extent (see the postcode sample towards the bottom of our Census Data page for an illustration) – contact support if you require further details. While we produce KML format for successful use in Google Earth, which is a stand-alone application, using the same KML files in Google Maps has some limitations over and above those of Google Earth, which is a script based application program interface intended for use from within a browser. For example there may be object size and complexity limitations for rendering in Google Maps, explained on Google’s site here. Some further restrictions on KML element support in Google Maps are also relevant as explained on Google’s site here. The image right shows our PC004VICDAT product uploaded to Google Maps, from where it can be deployed in a web site with relative ease (subject to our supplementary license agreement). Please note: Owing to the “open” nature of the Google community, there is a Supplementary Licence Agreement required for supply of our Data Series in Google KML format. The Licence wording is illustrated here. 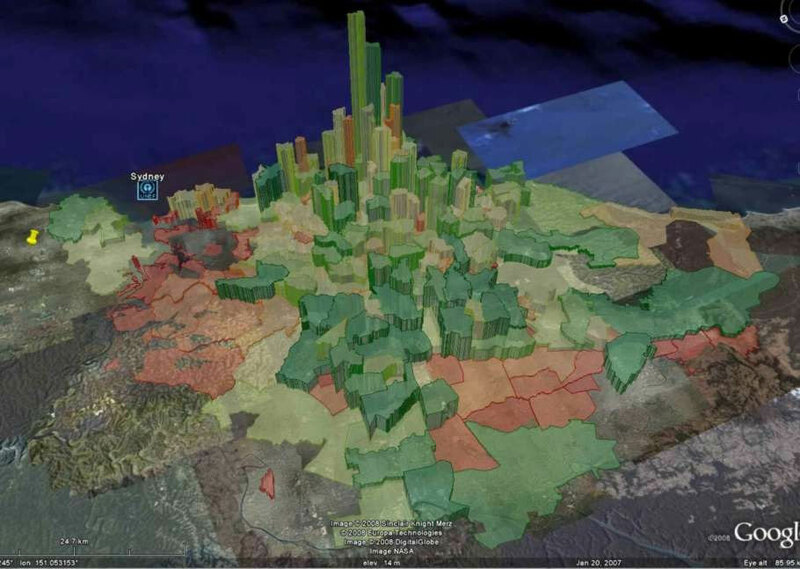 So great for display and fun to use, albeit with potential limitations especially in Google Maps, if you wish to engage in anything analytical using spatial data, it can only be achieved using a GIS application. Of course we can perform such analysis on your behalf and supply the processed results in KML format for you to use.